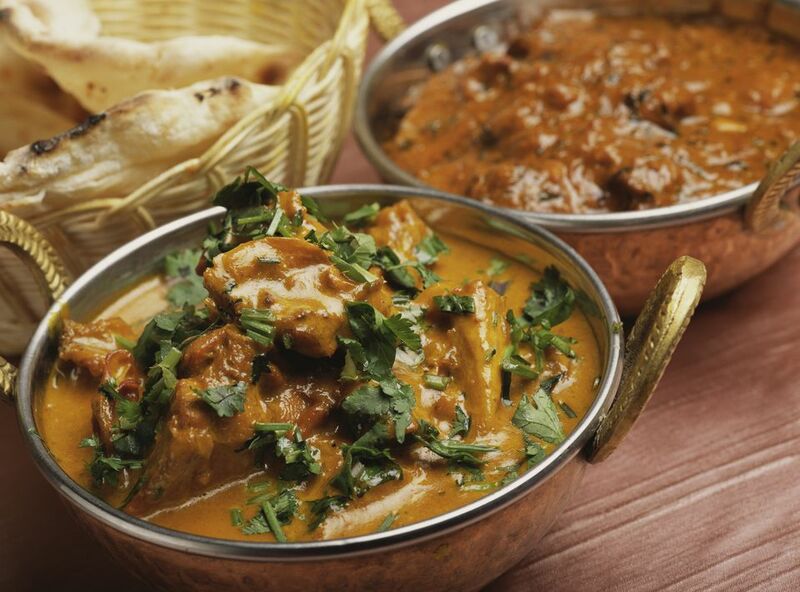 The complex combination of spices in curry is what gives the dish its wonderful, exotic flavor. Unfortunately, it is those same spices that can permanently stain if the curry spill is not removed quickly. They are even used to dye fabrics. Learn how to save your clothing, carpet, and upholstery after curry spills. You are going to have the best luck at removing a curry stain if you treat it as soon as possible. Begin by using a dull knife edge, spoon or even the edge of a credit card to lift away any curry solids from the fabric. If you wipe at the stain with a cloth or sponge, you may drive the stain deeper into the fabric fibers. This makes it even more difficult to remove. If the curry stain is on a colored garment that is dye fast, mix a solution of regular strength (20 percent volume) hydrogen peroxide and water. The solution should be very weak: one tablespoon hydrogen peroxide to one-half cup water. Hydrogen peroxide is a bleaching agent and should not be used at full strength on colored fabrics. Full strength hydrogen peroxide can be used on white fabrics. Mix the hydrogen peroxide/water solution in a shallow glass container. Place the stained area in the solution and soak for at least two hours. Rinse the stained area in cool, clean water and then wash the entire garment as directed on the clothing label using your regular detergent and the hottest water recommended for the fabric. If the stain remains, mix a solution of oxygen-based bleach (brand names are: OxiClean, Nellie's All Natural Oxygen Brightener, or OXO Brite) and warm water, following package directions. Mix enough of the solution to submerge the entire garment and allow it to soak overnight. If the stain is still visible, repeat this soaking step with a fresh solution. When no stain remains, launder as usual. Always check the stained area before placing the garment in the dryer. The high heat from the dryer can permanently set the stain. If the fabric is labeled as dry clean only, remove any curry solids with the edge of a dull knife or spoon. Do not rub with a cloth or sponge. Mix one tablespoon borax powder with one pint (two cups) of lukewarm water. Use a sponge to apply the borax solution to the stain. Do not saturate the stain, simply sponge on the solution and blot away the curry with a white absorbent cloth or paper towel as it is loosened. Repeat until no more curry color is transferred to the paper towel. When the stain is lifted, sponge the area with cool, clean water and allow to air dry away from direct heat. If any stain remains, take the garment to a professional dry cleaner and identify the stain. The stain remover included in home dry cleaning kits will not remove curry stains. When a blob of curry hits the carpet, use that dull knife or spoon to lift away all the solids you can. Take care not to spread the stain by rubbing. Start by mixing a solution of one tablespoon dishwashing liquid, two cups of cool water, and one tablespoon of white distilled vinegar OR household ammonia. Stir to mix well. Use a clean white cloth or paper towel and sponge the stain with the solution. Allow this mixture to sit for five minutes and then blot away with a dry cloth. Repeat until no more color is transferred to the white cloth. Next, dip another clean white cloth in plain water and blot the stain to rinse away any soapy residue. Move to a dry cloth and blot until all moisture is absorbed. Allow the carpet to air dry away from direct heat. If any stain remains, mix a solution of all-fabric oxygen bleach and warm water, following the package label directions. Blot the area with the solution and allow the solution to stay on the solution for at least thirty minutes, though one hour is better. Blot with dry white cloth and allow to air dry. Finally, vacuum the carpet to lift fibers. The same treatments can be used on most upholstery fabrics. Just take extra care not to over-wet the fabric. If the upholstery is silk, wool, or vintage, consult a professional cleaner especially if you need more stain removal tips.